Mr. Neeraj Garg, who was previously engaged with Volkswagen Sales India Pvt. 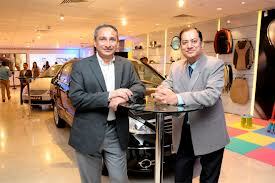 Ltd. joined Tata Motors as VP, Passenger Vehicles business at Tata Motors in Sep 2012. However, as per the confirmed sources, Mr. Garg has resigned from the current post and Mr. Ankush Arora, former VP, Marketing and Sales at GM, India will be taking over his responsibilities starting soon. Mr. Arora already joined Tata Motors on 23rd April 2013. When contacted, Mr. Garg confirmed and said, "Yes it is true. I have decided to move on from Tata Motors. At this age of my life,I am looking certain entrepreneurial ventures which could be in the automotive or allied businesses. It would have been tough to carry on with the existing profile at Tata Motors." Since, the time Mr. Garg joined Tata Motors, it has been a tough time since then, largely due to market slowdown. The market share of Tata Motors in passenger cars slipped from 10.87% in September 2012 to 4.92% in March 2013 and in passenger vehicles, it came down from 12.78% in September 2012 to 8.75% in March 2013. Talking about his short stint at Tata Motors,Garg said it was an enjoyable yet a challenging stint. Garg is an automotive industry veteran with an experience of over two and half decades in selling cars in India. Prior to working with Tata Motors, Garg has helped organisations like Volkswagen, Nissan Motor India and Honda Siel Cars India set up a base in India. The grapevine also goes, as Mr. Garg could join back Nissan Motors India or allied marketing business - Hover Automotive India. but Mr. Garg terms all these as rumours.